Tune in to a Facebook Live discussion and Q&A about our report on Saturday, August 18 at 2:30 PM ET. Our discussion will feature a panel that includes five independent legislators from Maine, Vermont, Colorado, and Alaska. The paper identifies strategies independents can use to bridge the growing partisan divide, but also identifies ways in which current incumbents are already leading a transformation of our politics. Pictured above: The Alaska Bipartisan Governing Coalition. In 2016, after two independents were elected, they caucused with 5 moderate Republicans and members of the Democratic Party. For the first time in 30 years, they flipped control of their legislature. 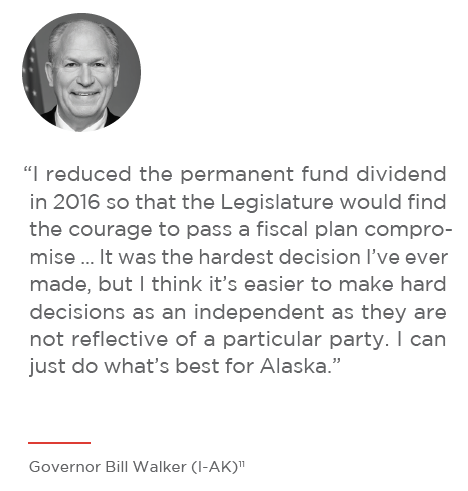 Together, they've addressed some of the long-standing challenges Alaska faces alongside an independent Governor. In Maine, neither party has a controlling majority in the state house because of six independents who caucus together. Across the country, 27 independents are serving in state legislatures.